An ancient Italian town whose remains are buried beneath the earth has been mapped by a team of researchers, revealing evidence of a bustling social and economic settlement 1,500 years ago. An ancient Italian town, which disappeared after its abandonment 1,500 years ago and now lies buried underground, has been mapped by researchers, revealing the location of its theatre, marketplace and other buildings. Originally founded as a Roman colony in the 4th century BCE, the site of Interamna Lirenas lies in the Liri Valley in Southern Lazio, about 50 miles south of Rome itself. After it was abandoned around the year 500 CE, it was scavenged for building materials and, over time, its remains were completely lost from view. Today, the site is an uninterrupted stretch of farmland, with no recognisable archaeological features. Now, researchers have successfully produced the first images of the ancient site, using geophysical methods that allowed them to look beneath the surface of the earth and map the layout of the entire settlement, which spans 25 hectares. The resulting pictures have already thrown up a few surprises. Earlier scholars had previously imagined that the Roman town of Interamna Lirenas was something of a sleepy backwater, but the large marketplace and theatre instead suggest that, in fact, it was a bustling economic and social centre in its own right. 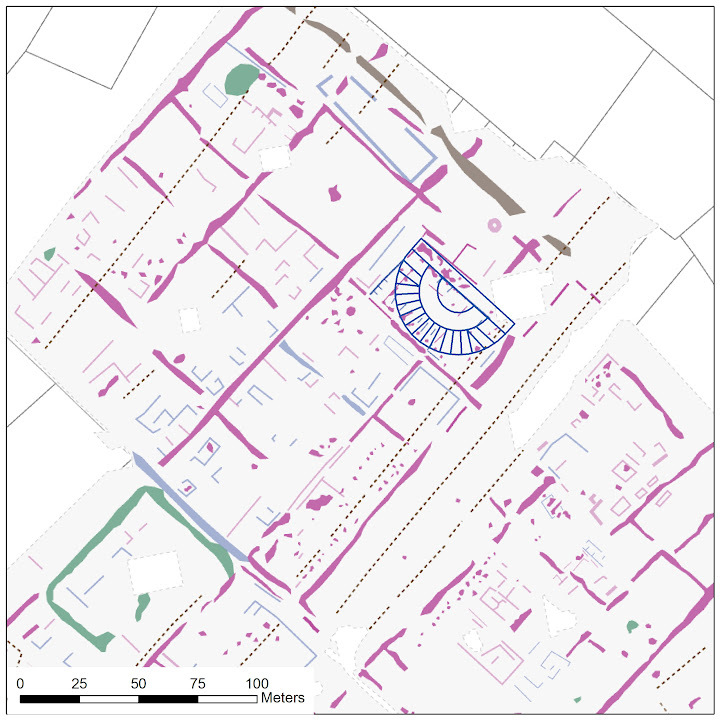 “Having the complete streetplan and being able to pick out individual details allows us to start zoning the settlement and examine how it worked and changed through time,” Martin Millett, Laurence Professor of Classical Archaeology at the University of Cambridge and Fellow of Fitzwilliam College, said. The images are the result of a project which began in 2010 that aims to understand more about what happened in towns established by the Romans as colonies in Italy following her conquest. This research is led by Millett and Dr Alessandro Launaro (British Academy Postoctoral Fellow and Fellow of Darwin College) in collaboration with Dr Giovanna Rita Bellini (Director of the Archaeological Area of Interamna Lirenas, Italian State Archaeological Service), the British School at Rome and the Archaeological Prospection Services of Southampton University. It has been generously supported by the British Academy, the Faculty of Classics (University of Cambridge), the McDonald Institute of Archaeological Research (University of Cambridge) and the town of Pignataro Interamna. 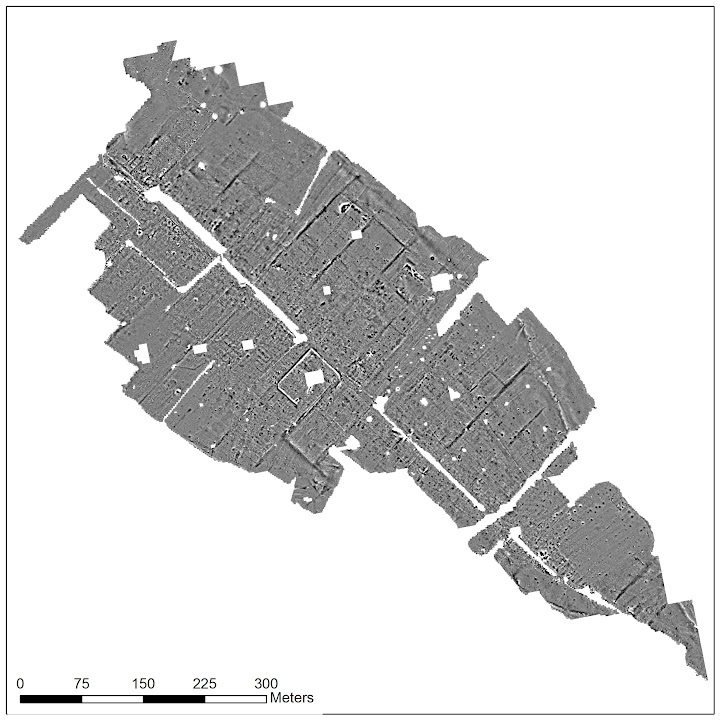 Interamna Lirenas is an enticing case study because, in spite of its size, it did not expand significantly during the high point of Rome’s Imperial age, meaning that it retained much of its original colonial shape and features. Thanks to antiquarian research, archaeologists have long since known that a town existed on the site, but it has never been excavated. One reason is that until relatively recently, experts believed that all Roman colonial settlements followed the same template – something which the new pictures from Interamna Lirenas are now helping to question. 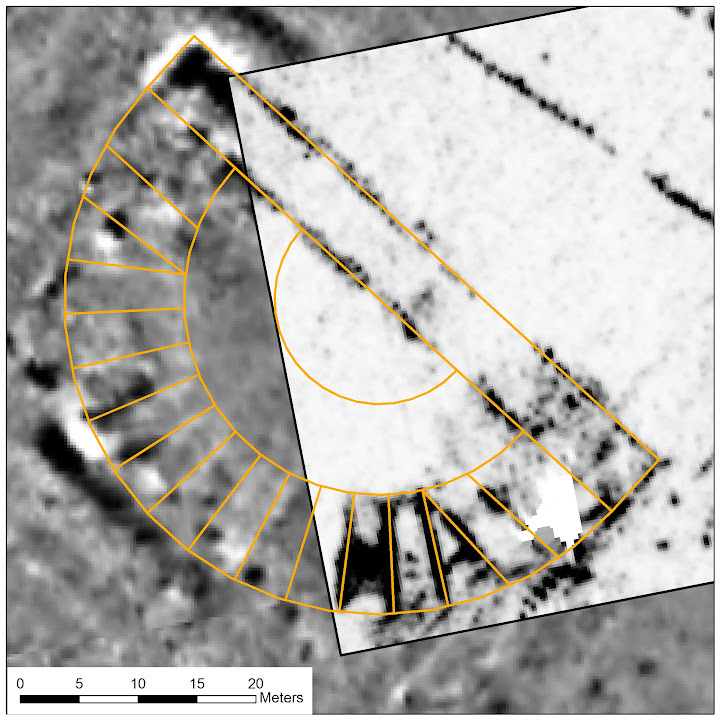 Knowing that a full-scale excavation of such a large area would be impractical, the research team decided to carry out a systematic geophysical analysis instead. The main techniques they used were magnetometry and Ground Penetrating Radar (GPR). 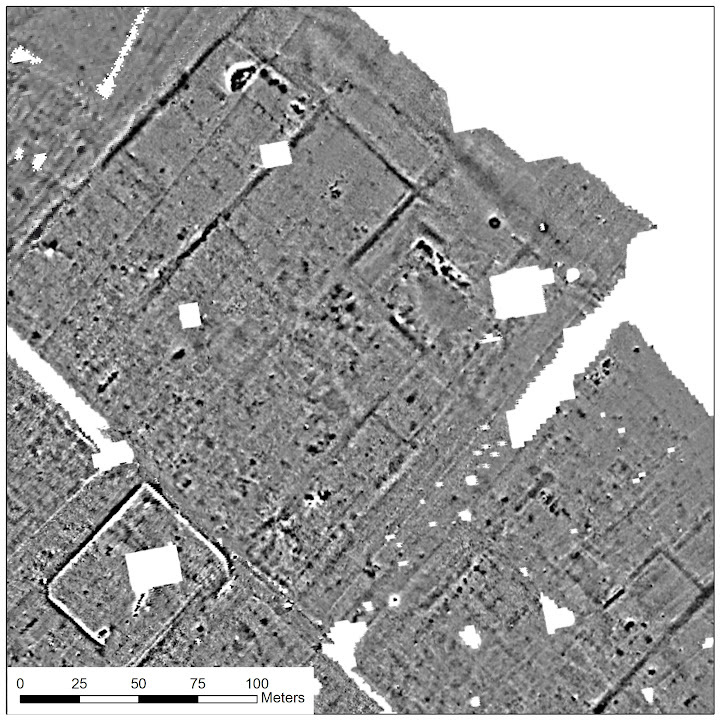 Magnetometry measures changes in the earth’s magnetic field caused by different features beneath the surface, and allowed the researchers to identify the town’s overall layout, many individual buildings and a wide open area in the settlement’s centre – its forum or marketplace. GPR sends electromagnetic radar waves through the soil to search for changes in its composition and the presence of structures. It does this by measuring the time in nanoseconds that elapses between a radar wave being sent and the reflected wave returning. This technique was applied after the initial survey revealed the existence of a large building at the northern corner of the forum that the researchers could not make out. GPR analysis revealed that the building had several walls arranged in a radial pattern, creating a semicircular seating area. This conclusively proved that they were looking at the remains of a Roman theatre. Judging by its structure, it is believed to date from some time around the turn of the First Millennium. Major public buildings of this type strongly suggest that, far from a backwater, Interamna Lirenas was in fact an important urban centre in its own right. In addition, the images add to growing evidence that Roman colonial settlements were more varied than some scholars have previously believed. As such sites are uncovered, it is becoming clear that even two colonial towns in close proximity to one another could often be quite different. The site of Interamna Lirenas itself, for example, lies close to the remains of another settlement, Fregellae. Both were built astride the Via Latina, the principal road running south-east from Rome. Yet despite certain similarities, the new results from Interamna Lirenas reveal important differences, including the position and plan of its market-place which includes a dominant temple and adjacent theatre. These features matter, Millett argues, because the traditional view was that each colonial settlement had a standard template so that Rome could project a certain image of itself for the benefit of a subject population. Yet the new pictures from Interamna Lirenas show how different towns were designed according to equally different ideas about how a colonial town should look, and what the community’s priorities should be. The Cambridge team is now about to embark on a five-year project which will try to confirm this conjecture, and answer other questions, using further geophysical analysis. The first proper archaeological excavation at Interamna Lirenas is now also being planned.